Size: approx. 10-15 mm. Photo: 09/05/11, 2 pm. 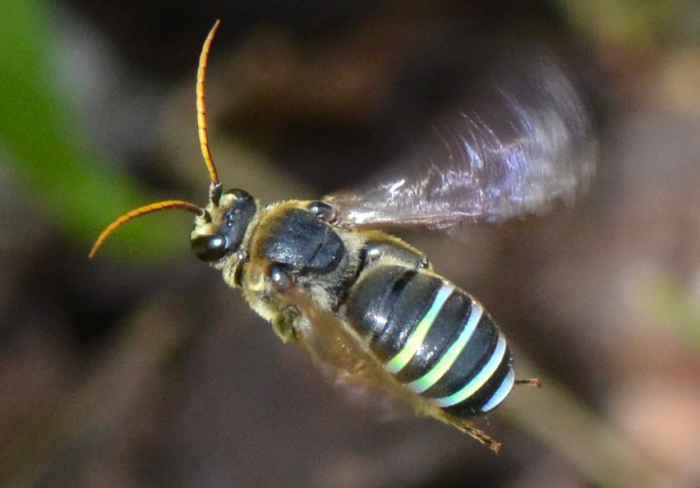 This sweat bee is an Alkali Bee (Nomia sp.). In Greek mythology, Nomia is a daughter of Zeus and a beautiful though jealous naiad. Please have a look at the second photo and the video. They show the bee attacking a colleague, which in my opinion belongs to another species (the stripes are more yellowish than green). Unfortunately I have no idea what was going on but the attacks repeated several times. The "victim" didn't show much of a response.